Date: 11 Aug 2016 11:02 p.m.
She has been pee pad trained over at the pet seller shop. She can pee and poo at the tray, no problem. I usually clean her poo almost immediately. However, the pad is only change the next morning. 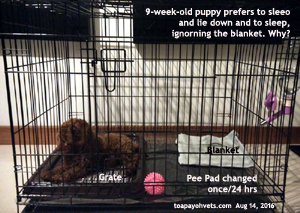 A) My problem is my poodle likes to sleep on the pee tray/pad (see attached picture) I tried carry her back to her blanket but after a while she returned to the tray. I clean the 'sleeping area' well and make it comfortable for her but still fail. What should I do? I will only bring her food bowl in during meal time. She has a water feeder at the right hand side. Takes a 1-2 hours after meal to poo. Every morning, there will be lots of poo at the pee tray. By then, she's awake and sitting upright at her blanket area. When she's excited, she will be stepping all over her poo if I don't clean them fast enough. B) I was told to confine her in the crate till her 3 vaccination (Mid Sept) However, I do let her out of the crate for a 30 mins run around my living room for some form of exercise, twice a day to exhaust her energy. If not she will be whining during the night. Is this acceptable? C) In the future, I wish that my dog could roam around my house without restriction but toilet trained. How do I migrate from pee tray to common toilet bathroom floor? When will be a better age to start such training? D) How long should we crate our dog? Thanks! Your help is greatly appreciated. MOST LIKELY, THE SELLER CHANGES THE PAD MORE OFTEN AS PUPPIES ARE VERY CLEAN CREATURES. IF YOU CHANGE ONLY ONCE, THE PUPPY AVOIDS THE SOILED PEE PAD OVERNIGHT AND SLEEPS ON THE GRATE (you refer "grate" as "tray" which is an incorrect term). 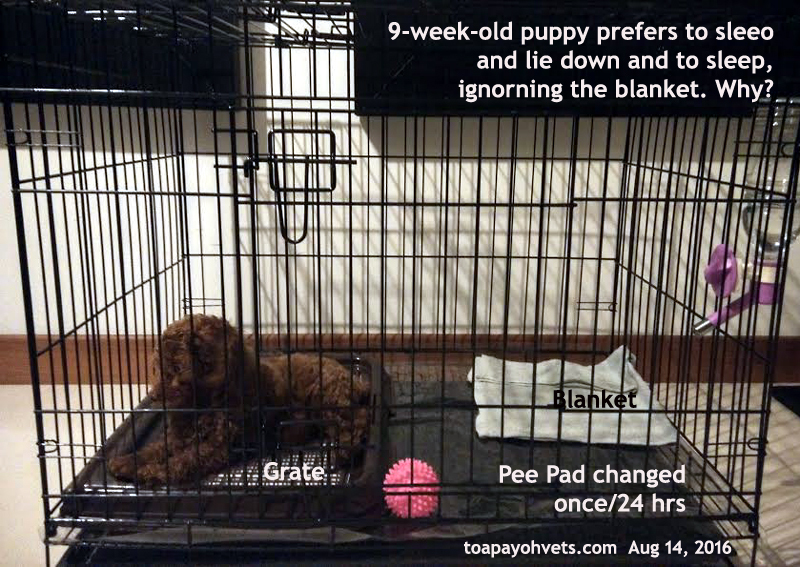 FROM YOUR IMAGE, THE PUPPY PREFERS THE GRATE AS IT IS CLEANER THAN THE PEE PAD (CHANGED ONLY ONCE/24 HOURS) + BLANKET AREA. 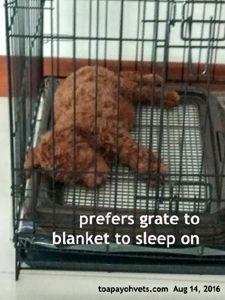 SO THE GRATE IS THE CLEAN AREA TO SLEEP AND LIE DOWN AS SHOWN IN YOUR IMAGES. THE BLANKET IS SOILED AND SMELLY AS THE PUPPY WITH SOILED PAWS STEPS ON IT DURING YOUR VISITS. WATER BOTTLE SHOULD BE POSITIONED ON THE SLEEPING AREA WHICH IS CLEAN AND IS ON THE LEFT SIDE. Every morning, there will be lots of poo at the pee tray. LOTS OF POO ON THE GRATE? 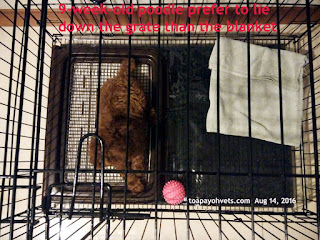 DOES IT MEAN THAT THE PUPPY SLEEPS ON THE PEE PAD AND BLANKET AT NIGHT AND PEES AND POOPS ON THE GRATE? By then, she's awake and sitting upright at her blanket area. When she's excited, she will be stepping all over her poo if I don't clean them fast enough. THE CRATE IS SMALL. NOW IS THE BEST TIME TO MIGRATE TO THE TOILET BATHROOM FLOOR. BUY A FENCE. PUT PEE PAD IN FAR RIGHT. CLEAN SLEEPING AREA AND BLANKET ON LEFT SIDE. NO WATER AFTER DINNER AND OVERNIGHT. 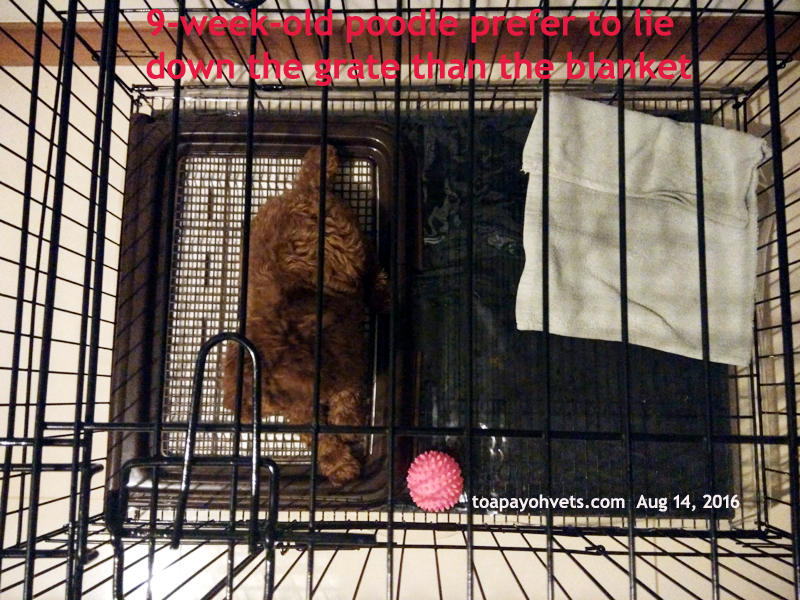 MUCH DEPENDS ON YOUR SUCCESS IN TOILET TRAINING, YOUR TIME SPENT IN TRAINING AND THE SIZE OF THE CRATE. SOME OWNERS TAKE 2 WEEKS. SOME TAKE 2 MONTHS OR MORE. I hope the above advices are useful. Do let me know 4 weeks later.